Online Customer Experience Software is designed to enhance a customer’s experience with a business. Customer Experience Software may include software which uses social media capabilities to enhance and deepen relationships and build brand loyalty. The Customer Experience Software here is offered under the SaaS (Software as a Service) model, meaning that the software is web based, hosted on the Cloud and can be accessed when needed through a client or web browser. If you’re looking for similar online software like Customer Experience Software, consider our Customer Loyalty or Customer Service Software categories. 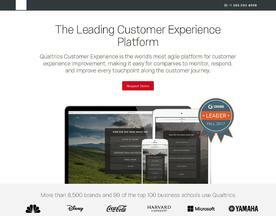 Qualtrics Customer Experience helps organizations create conversations with customers and measure their experiences across all touchpoints, prioritize and predict key experience drivers, and drive action throughout an organization.